Ten people, including two children, visited Race Rocks and toured the lighthouse and grounds. Many of us were enthusiastic photographers, including the kids, and several of us were birders as well. 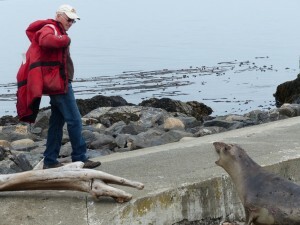 Garry Fletcher, the warden of Race Rocks Ecological Reserve, was our guide for the trip. We had a very calm, warm day, mostly sunny with a touch of fog. The boat left from the Pearson College dock in Pedder Bay at 10AM, a 15 minute ride over calm water. At the entrance to Pedder Bay, Garry had the boat stop to show us the relay of the webcams from Race Rocks to Pearson College. He mentioned that the signal just clears the trees on the DND property at Rocky Point. Hundreds of Pigeon Guillemots gave their high-pitched whistles as we approached the island. The tide was quite low, and embarking from the boat was a long step up. 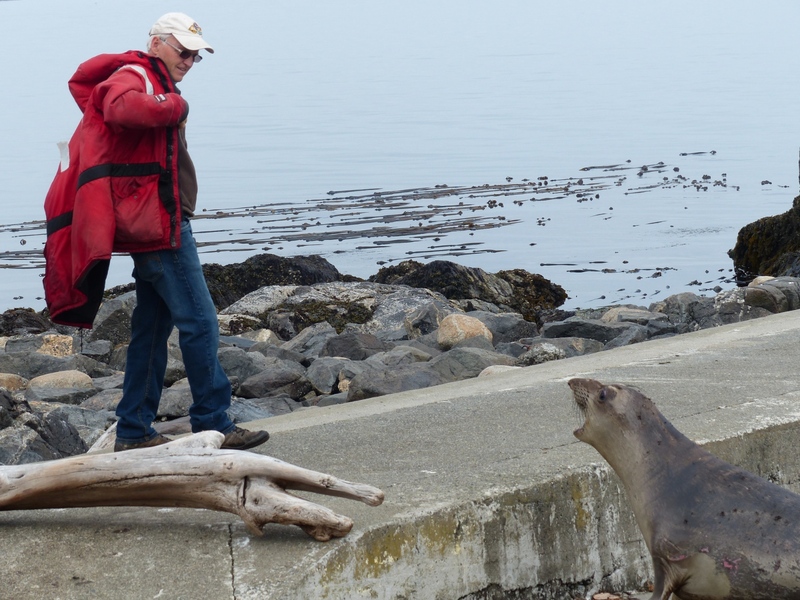 We were welcomed by Mike Robinson, the resident eco-guardian, and two Elephant seals along the concrete dock who were showing their teeth and grunting when we came too close. Guillemots and Black Oystercatchers called and kept a sharp eye on us. 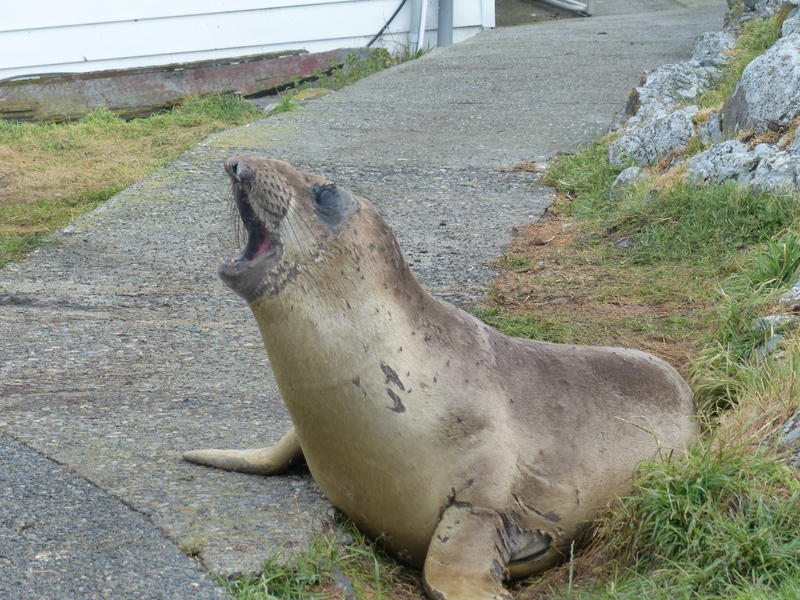 Walking close to Elephant seals was unavoidable, since about a dozen lay along the concrete paths around the lighthouse. Six were lined up in the sunshine among the garden flowers planted by former residents. We had very close views of pink mouths, last years’ fur being shed, red-rimmed eyes and occasionally scars, which are used to identify individuals. Flies (a non-biting native species) were abundant, and the smell of guano was pretty strong. Canada Goose were nesting, incubating addled eggs. Grass and native plants around the lighthouse are stressed by geese grazing and by the many sea mammals hauling out. An exclusion plot has lush, tall grass, while the grass outside is very short. Garry took us down to the intertidal zone at water’s edge. He showed us many marine organisms and told us hair-raising stories of giant boulders which have been moved by the ocean’s awesome power. A pond created for study purposes is now roofed over by a huge rock shifted in the storms. He also showed us Anita’s Pool with its amazing diversity of creatures. Steller sea lions were on a rocky island offshore, roaring and lolling in the sun, along with several Elephant seals, California sea lions and Harbour seals. Steller’s golden or light brown fur was gleaming photogenically in the sunlight. The massive bulls towered over the smaller cows and calf sea lions. The roaring of the bulls can be heard all the way to Rocky Point. The only numerous birds on the main island were the hundreds of Pigeon Guillemots which nest there. They were very elegant with their crisp black and white breeding plumage, and bright red feet and mouth linings. We also saw 10 Brant in flight, a Wandering Tattler down on the rocks and two juvenile Bald Eagles near the sea lions. Two each of Barn Swallow and Savannah Sparrow were also seen. We were shown the power plant. One of our group had been a lighthouse keeper himself, and mentioned how his noisy generator had to be run almost continuously. The solar power at Race Rocks means the engine only has to be run a short time each day – a big plus for peace and quiet. Lastly we climbed up to the top of the lighthouse. I loved the wonderful acoustics in the staircase and the great view from the top. Garry talked about the history and future of the lighthouse. It’s not certain which level of government will be responsible for the maintenance of the site and its future is uncertain. 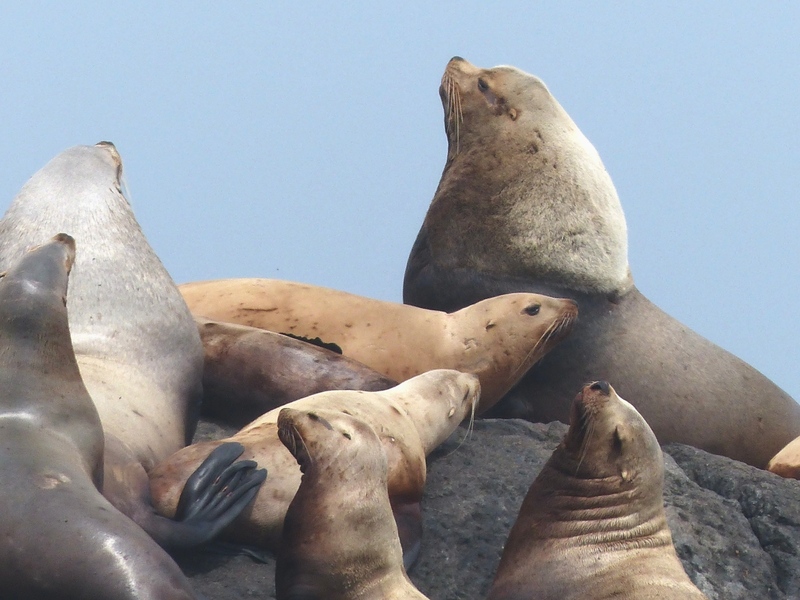 We had wonderful close views of the sea lions as we set out on the return trip at 12:30PM. 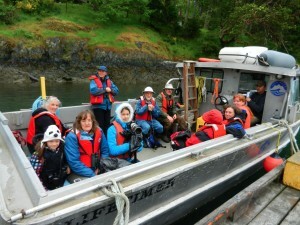 Thanks to Garry and Friends of Ecological Reserves for this rare opportunity and a very interesting trip.